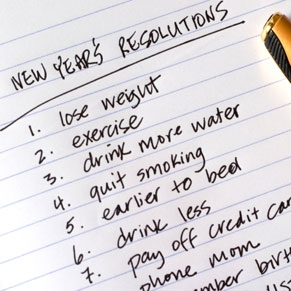 Do you have some New Year’s resolutions in mind for 2013? Let me guess: You want to lose weight? Exercise more? Drink less? 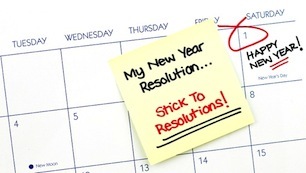 Half of all Americans make resolutions for the new year, but few are able to stick to them. In fact, about one-quarter of us will fail in a week; one-third won’t make it a month and fewer than half will last six months. Despite the lack of success, our resolution solutions are designed to help you develop resolutions that keep you more accountable and engaged in seeing them through. Resolution: I want to lose 30 pounds. Instead, breakdown this big, long-term weight loss goal like this into several smaller, achievable goals that have a set deadline. This will help you stay on track and drastically increases your odds of success. Write your goals down and share them with others as it helps you be accountable for them. “Focus on strategies to help you lose weight rather than a number on the scale,” says Sarah Koszyk, MA, RD, a San Francisco-based dietitian specializing in weight management. “A goal of shopping for healthy foods twice a week so you prepare more home-cooked meals is more likely to help you lose weight than vowing to lose 20 pounds in 2012.” Other goals that are proven to help with weight loss include tracking what you eat and drink, drinking at least half your body weight in fluid ounces of water, cutting back on portions, not eating when distracted and having an exercise routine. Resolution: I’m going to give up sweets, lose 10 pounds, run a marathon and finish a triathlon. While we admire your enthusiasm, there may be a better approach to ensure that you accomplish all that you want. Trying to bite off more than you can chew is a recipe for failure. It’s better to stick with one goal that’s measurable and achievable and reach it then tackle your next goal. So, we’d recommend starting with the weight loss goal and setting up strategies that will help you peel off pounds. Once you can check that goal off, tackle the next. Spend more time figuring out the right goal and your path to success rather than having several resolutions that pull you in too many directions so that you can’t achieve any of them. Resolution: I’m never eating chocolate, candy or ____(fill in the blank with your favorite unhealthy food) again. Banning your favorite foods or beverages will only eventually backfire and it fuels a unhealthy relationship with food. Your resolutions should focus on progress not perfection. Having a “perfectionist” type of goal is a recipe for failure. Instead, set more healthy goals to reduce the amount or number of times you eat or drink them per week. If you now it this trigger food daily, enjoy it two or three times a week. Once you’ve mastered that, then consider eliminating it from you diet, if you still think it’s hurting your diet progress. Resolution: No more excuses: I’m hitting the gym every day! An all-or-nothing approach to exercise is a guaranteed way to make sure you won’t be able to make good on your goal. Instead, if you’re new to exercise, start with baby steps. Resolve to get at least 15 minutes a day of exercise two or three days a week (or more depending upon your current exercise level) then add a few minutes to that each week. Or try this challenge: Start with one push-up and sit-up or 1 burpee on January 1 and add one more each day of the year. On January 1st, you do one push-up and one sit-up (or one burpee), on the 2nd, two push-ups and two sit-ups (or two burpees), and so on. By December 31, 2013, you’ll be doing 365 push-ups and sit-ups (or 365 burpees). Your goals should be a challenge but shouldn’t sabotage your best efforts and desire to make positive change in your life These food-related behavioral changes don’t happen overnight, so think progress not perfection. Until the good gets better and the better gets best! You may occasionally fail or have a set-back. That’s ok and you should expect it. When it does, accept it, own it, and move on by getting back on track. To help you get on track and stay on track in 2013, check out our monthly meal plans and of course, our new book, 101 Fat Habits & Slim Solutions.